There are two types of poker book; the ones you read once and the ones that you read again and again throughout your poker career. I strongly believe that the books below are the latter. Below is a list of what I believe to be best strategy books in each category from general strategy, no limit cash game strategy, tournament strategy and ebooks. The Theory of Poker is the best all-round poker book you are going to read. It does not address the game of Texas Hold'em specifically, but the true value of the book is that it teaches you how to think like a winning poker player. Starting hand charts and quick-fix rules will only take you so far, as being able to make the best plays possible based on your analysis of a situation makes the difference between an average and great player. It's a must read for every serious poker player. This is another great all-round strategy book that covers all of the most popular variants of poker. It is an enjoyable read and contains informative strategy for helping you develop a solid all-round game. I would personally choose Theory of Poker over this if I could only choose one "general" strategy book to read, but that's not to say this doesn't have value. I'd would however choose this book over ToP if I was very new to the game due to the fact that it is easier to follow and understand. This book is definitely not an easy read for beginner players, so you should only pick up this book if you already have a sound knowledge of good Hold'em strategy. No Limit Hold'em: Theory and Practice can be hard to follow at times, but it does contain a lot of very valuable information. The material is a little complicated, but it is well worth reading if you want to be able to absorb some of the most advanced strategy that you can get from a Hold'em strategy book. Professional No-Limit Hold'em is an easier read than Theory and Practice, and does a very good job of covering the fundamental strategy for a profitable game. One of the most useful topics of the book is the REM process, which explains the importance of Range, Equity... Maximize - one of the most important concepts to learn about as an intermediate player. A number of other unique topics are covered in later sections that have no been covered so well in other books. This is not an easy read for beginner players, and it may act as more of a re-cap for advanced players. I would recommend this book to players working on moving from a break-even to winning game. It's a close call between Theory and Practice and this, but I prefer reading Professional No Limit Hold'em. Tournament strategy (MTTs and SnGs). This book is a like a collection of gems of information for the game of NL Texas Hold'em. Every time I read it, I pick up something new that I had never fully considered before. It is not the most advanced book out there, but it definitely has a lot to offer to the beginner players and a little something for intermediate players. The book is split up into digestible segments and is very easy pick out useful information without being overloaded with too much strategy and thought processes at once. I will go ahead and say that this is my favourite Texas Hold'em strategy book to read. I would recommend that all no limit Hold'em players read this book at some point, regardless of what level you might currently be playing at. The Harrington on Hold'em series is widely regarded as the Bible (Bibles?) for Texas Hold'em tournament strategy. If anyone ever asks for a recommendation on a good tournament strategy book, you can be sure that the question is quickly followed by the acronym HoH. This first book covers the main bulk of strategic play of tournament poker. The book contains a lot of useful hand examples with each individual being explained very clearly and succinctly. HoH is comfortably one of (if not the) best series of books for tournament poker strategy. This is the second installment of the HoH series. This book is equally as good as the first and focuses on endgame strategy as opposed to early strategic play. The majority of tournament players will buy both volume 1 + 2, as they go hand in hand. Think of them as one big book split up in to two. The third installment is more of a optional extra, although it does contain some great stuff. This book is the perfect compliment to the HoH series (above). I wouldn't recommend this book over the tournament books by Harrington, but I will say that it should be on the list of essential reading for anyone looking to play solid tournament poker. The Poker Tournament Formula takes a slightly more aggressive approach to playing poker tournaments, which is why it works to your advantage to read both the HoH series and this. If you are looking to expand your tournament strategy after HoH 1, 2 and 3, look no further. This is the sequel to the widely acclaimed Kill Phil book (not actually written by Phil Helmuth), which had outlined basic strategy for a good preflop game in Hold'em tournaments. This book takes it up a level, and contains more advanced information on how to play later streets. 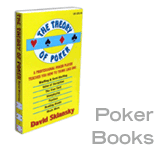 This book covers both MTT and SnG strategy. Kill Everyone is quite like a Sklansky book in that it contains a lot of great strategy, but it is not an easy read. I wouldn't recommend this book to a novice, but I think that any intermediate player will find this very valuable indeed. As you would expect, this book focuses on the Sit 'n Go tournament structure as opposed to the larger MTT games. I believe that this is the best NL SNG specific strategy book out there, with the book being packed with quality strategy and very informative hand examples. This isn't a book for complete novices, as it does require that you have some basic knowledge of SnG games and how to play poker. However, I think that a beginner player should be able to digest the majority of information in this book. Overall, you're not going to find a better strategy book for Sit 'n Go poker games. For a big list of very useful and informative reviews on the majority of these books, check out the LV Revealed gambling book reviews. The user reviews on the Amazon site itself also do a very honest job of helping you find the better books. There are a load of really bad Texas Hold'em strategy ebooks out there, so be careful. Anybody can write an "ebook", claim it is the best strategy in the world and then sell it to the unsuspecting visitor. When it comes to poker ebooks, you are far better off going on recommendations as opposed to how good the sales page sounds. Below are the top 4 ebook-only strategy books for the intermediate/advanced player. These are genuinely valuable ebooks with great strategic advice. This is a widely acclaimed strategy guide for playing small stakes 6max NL Texas Hold'em. You are not going to find a more informative ebook with such great strategy anywhere else, and I highly recommend that every 6max player reads this book - it's a gem. Here is a 2+2 thread discussing the ebook. This ebook by advanced Hold'em player Bill Vosti is held in very much the same regard as Ryan Fee's book. A very useful chapter from this book is about understanding PokerTracker stats and how to play against opponents based on these stats. I don't believe that you will find a clearer guide to these stats anywhere else. At $50, it is more expensive than your standard book. However, every player that has read this book will agree that it is great value for money, so you will not feel hard done by with the quality of strategy information provided. Here is a Bill Vosti ebook 2+2 review thread. I'll go ahead and say that this is the most complete strategy ebook written for small stakes 6max Texas Hold'em (as you might have guessed). In fact, this should really be made in to an actual book. Written by the well known writers; Miller, Mehta and Flynn, this is the most thorough piece of work that you are going to come across for 6max cash game strategy. You can find out more about the quality of this book in the 2+2 review thread for Small Stakes No-Limit Hold'em. As I say, you should be very skeptical about any ebook with a big long sales page. Anyone can write a book and tell you it's the best strategy ever, but a lot of the time they do not deliver. If you ever have any concerns about the quality of an ebook or normal book, search for online reviews. The 2+2 forums usually give very critical and honest advice, so try searching those. The strategy ebooks above do a very good job of covering fundamental strategy along with some more advanced concepts that will be very useful for small to mid-stakes players (up to around $400 NL). However, a small number of exceptional online players have written quality ebooks for a very high price. Haven't read this book, but you can read a review thread about it at 2+2. BobboFito is a very well respected high stakes NL Hold'em player that makes videos for the LeggoPoker.com training site. To buy the book, contact BobboFito through the forums at LeggoPoker.com. Here is the LeggoPoker BobboFito ebook discussion thread for you. Very expensive, but again, there are no bad reviews on this book. If you have the money and you are very serious about your game, this would be a wise investment. Advanced and serious players only of course. Save 10% at Daily Variance by using the discount code POKERBANK10. A lot of you will have to re-read the prices of these advanced ebooks to make sure that you read it correctly, which is to be expected. These books contain a lot of highly valuable information from some of the most advanced Hold'em minds out there. They are very expensive, but you will never find a bad review about them. You do not need to buy these books to be able to win money from poker. In fact you can make a living from poker simply by reading solid strategy books from the top of the page and through a lot of practice. If you have the money however and want to get inside the mind of very successful online players, they will not disappoint.